How can we call forth light in our aura? Which mantra can we use for the alchemy of change in our lives? What does it mean to flow with the great river of life? How do we feel our oneness with God? Where do we begin today? Well, let's begin at the beginning. 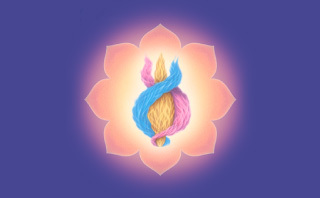 Let's visualize the threefold flame expanding from within our heart—the blue plume of the Father and God's power to the left, the yellow plume of the Son and God's wisdom in the center, and the pink plume of the Holy Spirit and God's love to the right. This threefold flame of the Trinity is visualized by the mind's eye, by the soul. In our devotion we are seated comfortably. We visualize the drawing of a magnetic sphere of white light around the flame, which expands as a great sphere of our cosmic consciousness. Beloved sons and daughters of God, you who are reading this web page, I invite you to join me in this meditation with Kuthumi, our own dear Saint Francis, our brother and devotee of Christ. We are one in the flame of God and this flame is our joint heirship with the great wayshower of our destiny. Jesus came to show us that as he expanded the light of the aura for the healing and the transformation of consciousness, so we can and must go and do likewise. I invite you to share in the understanding of yourselves as sons and daughters of God, which John the Beloved, the disciple who was so close to our Master, has taught us. As sons and daughters of God with Jesus, we then can call forth this light and, according to our faith in the God who lives within us, we can move the mountains of adversity in our lives. Therefore you feel God giving this mantra through you. It is as if God drops a portion of himself as a pebble in the pond of your being and the ripples in concentric rings go forth from you. And when they reach the shore they return to the center, and their returning to the center is like the echo of God. As his voice has gone forth from you, so it will return to you with that fulfillment and that supreme joy of living on earth here and now in that great flame of the I AM THAT I AM, which you are. Sometimes people feel that a mystical understanding of Jesus Christ and of Gautama Buddha is beyond their ability. Perhaps they feel that they are not educated enough to understand. If you think that you are one of these people, or if you feel you do not have the intelligence to understand God's laws, perish the thought—because God lives in you and his mind is in you. And it will open in answer to your prayer and by your flowing with the great river of life, flowing with the stream of his consciousness, by your giving of the Word. You will find that The Human Aura, by Kuthumi is simply written and the only stumbling block might be a word here or there, which you can easily find in a dictionary. Kuthumi, who was incarnated as Saint Francis, appeals to the simple folk, to the common people, to those of us who understand God innately, who do not want to be confused by complex theological doctrine and dogma but who live in the basic awareness that God loves us, that we are his children and that he has placed within our souls the understanding of how we must return to him. Can you imagine that God would create us without that innate formula of understanding and of knowing the path back Home? 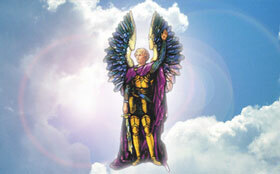 The Ascended Masters' teachings show us how to read what is already within, the law that is written in our hearts. I do not suppose that I can teach you anything, but only that I can remind you of the great storehouse of truth that God has already placed within you. I call in the name of Jesus Christ, in the name of Kuthumi, to all the saints and the heavenly hosts to now go to each soul and touch the heart of each one who would be closer to God and closer to the reality of his own individualized I AM Presence. 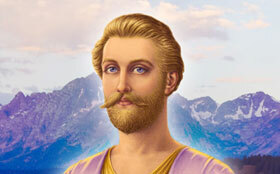 I call for the great light of understanding of the Cosmic Christ, Lord Maitreya; of Jesus Christ and Kuthumi, the World Teachers; of Gautama Buddha and all who are serving with the evolutions of earth for the advancement of consciousness. Beloved heavenly Father, we know that whatsoever we ask in Jesus' name and according to thy will, it shall be fulfilled in this hour. Therefore touch these hearts and let them know thy indwelling presence and let that presence be for the healing of soul, mind and body and for the healing of the nations. In his name we accept the answer to our call this hour. Amen. A lot of our brothers and sisters don't feel this oneness that you talk about so often. Could you tell us more about it? It hurts me that those who are the Body of God upon earth do not know one another, that they have been separated by those who have sought to come between their great love for one another and for God. Sons and daughters of God, his children, people of light everywhere are one, one by love but also one by the mathematical formula: Things equal to the same thing are equal to each other. Every son and daughter of God upon earth has within his aura a certain charge of that Christ consciousness, of that oneness with Jesus and Gautama. Every son and daughter of God knows within himself that he is the beloved of God. And yet from every side he is told the contrary—that he is a miserable sinner, that he is not able to raise himself up and approach the altar of the living God because he is a thing of shame. And then there is the problem of being alone, the lonely ones. It is my desire to provide the open door for that great friendship of all who understand the oneness of life, the heavenly hosts and all who have espoused the same cause—who understand that we came to earth to set the children of God free, to “set the captives free,” to draw all of our brothers and sisters out of the false theology, the doctrine and dogma of the false Christs and false prophets who have come to divide us with their schemes of darkness and divide-and-conquer tactics. The penetration of the great teachings of the Lord's hosts within our midst is like the coming of the sun as the morning mist disappears and we feel this friendship, this liaison with Ascended Masters, heavenly hosts, saints who have gone on, loved ones. And we know that in every community, in every town and city upon earth there are those who have this same calling to intensify the light of the aura, to expand the aura, to be step-down transformers for the consciousness of Elohim. God has placed us in every religion, in every church, in every government to be that focal point, to meditate upon his law night and day and therefore to transmit that law because we are all sending stations. 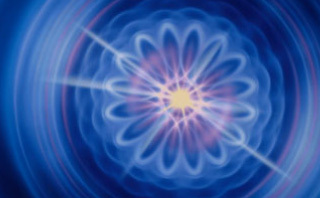 We all are receivers and transmitters, like radio stations, and we are sending waves from the aura daily. Above all, let us now promise that we will send to each other these radio waves of love and that we will thereby strengthen the Body of God upon earth and our unity with the Body of God in heaven. Being part of this Mystical Body of God, we can truly say, “God is one.” For we have become cells in that Body and we experience the oneness of the person of God, the “pure son” of God, of which we are all a part. And therefore in this mystical awareness we can truly understand there is only one Son of God, “the only begotten of the Father, full of grace and truth,” Christ the Lord, who lives within us all. We share his table, his Communion cup. This is the great teaching, the true teaching of Christ revealed through his servants the Ascended Masters and the Messengers in this age.